Depending on where you live, your home may be fed by single-phase or 3-phase electrical connection. What relevance does this have for your solar PV installation? Regardless of whether you have a single-phase or 3-phase connection, the appliances in your home all (almost certainly) run on a single phase. (3-phase power is used to power motors in certain industrial applications, but not in homes.) In the case that you have a single-phase connection, electricity flows in and out of your home through a single phase (imagine a single cable/circuit). If you have a 3-phase connection, on the other hand, the electricity entering your home is divided into three separate phases (imagine three cables/circuits). Different devices in your home will be powered by these different phases. For example, your lights may run on one phase, while your washing machine and refrigerator may be on the other two phases. 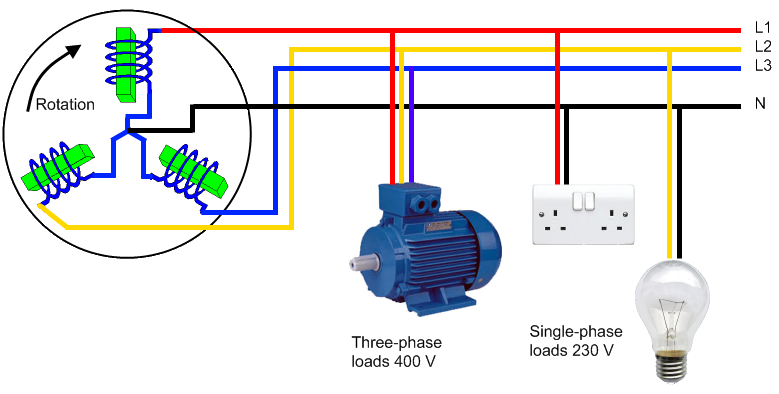 The image below, from Prolux Electrical, illustrates how 3-phase power is ‘divided up’ for household & industrial loads. You can see that all three phases feed into the industrial motor, while the light globe and power point are each serviced by a single phase (represented by the yellow and red lines, respectively). What the number of phases mean for your solar PV system? If you don’t have a solar PV system, you may very well have no idea if you’re on a single-phase or 3-phase connection. Regardless of which one you have, the electricity you use is most likely being delivered seamlessly to all of your appliances – so it’s not really anything to be concerned about. In the event that you want to install a solar PV system, however, phases matter. For a single-phase connection, a single-phase solar inverter should be installed – fairly straightforward. For a 3-phase connection, on the other hand, there are a number of options. In most cases the best and simplest option is to get a 3-phase inverter, which will distribute the solar power evenly across all three phases. Another option for a 3-phase connection is to install one single-phase inverter on one of the phases in the home (preferably the one that uses the most electricity/has the heaviest loads). The downsides of this approach are that 1) if the solar system is too large, the inverter could ‘trip out’ if the voltage for that phase goes to high, and 2) the solar energy may not flow to the phase where it is needed most. For this reason, with this approach it’s important to have your solar installer undertake an assessment to determine which phase is the best one – if you install on the wrong phase, the energy that your solar system generates could end up going to waste. The third option is to install multiple (up to three) single-phase inverters, each one on its own phase. This could prove to be a more expensive option than simply using a 3-phase inverter, however, so it’s important to consult with several solar installers to collect a variety of quotes and opinions before making a decision. It’s also important to check whether your phase connection will have an impact on the size of solar system that you’re allowed to install. Generally speaking, tighter solar system size limits are placed on homes with single-phase connections than those with 3-phase connections. In South Australia, for example, solar PV system size is limited to 10kW in buildings serviced by single-phase connections, whereas homes and businesses with a 3-phase connection may install systems as large as 30kW. Generally speaking, this is why a requirement for special approval from utilities for grid-connection of large solar PV systems in remote areas (which are sometimes serviced by ‘single wire earth return’ or SWER lines) is more common than in areas with high population densities. AC (alternating current) electricity. AC electricity is what most household electrical appliances require to operate. The other type of electricity, DC (direct current), is what solar panels and batteries produce. DC electricity is converted to usable AC electricity through a device called an inverter. AC current is distinguished from DC current primarily by the fact that its direction ‘switches’ back and forth rapidly, whereas DC is uni-directional. Without getting into the technical details as to why, this property makes AC electricity more suitable for long-distance transmission. I have been quoted the same price to install a 5.4 kwh solar system on my house. One is through my electrical company with a 1 phase inverter system and the offer of a $.22 buy back program for 2 years. My other quote is for the same price and system with a 3 phase inverter system but I wouldn’t get the $.22 buy back program with my energy company. My house is set up as a 3 phase system (it has the potential to be split into two units which I may do in the future) so would it be best to go with the 3 phase inverter at this time? In our experience, ‘extra generous’ feed-in tariffs these days usually have hidden costs elsewhere that tend to cancel out the benefits of the higher rates. Make sure you take a close look at the net benefit that the system is likely to deliver (you can use our solar payback calculator to work out some indicative figures). Give us a call on 1300 78 72 73 if you’d like to discuss your options in further detail, or if you’d like to have a look at other quotes from your area fill out our Quote Comparison Request form to get an instant comparison of prices, products & warranties. For a 3-phase connection, installing a system with a 3-phase inverter is usually the most straightforward & beneficial approach. Although it might cost you a little bit more than a system with a single phase inverter, you are likely to be happier with its performance in the end. Make sure you have a chat with installers about your options & best approach as well (i.e. always get a second – or third – opinion). As for the extra charge for the 3-phase inverter, that’s par for the course. It’s not very professional (and clearly confusing for you) that they’re changing things up on you at the last minute without explanation. The difference between the two solar panel array configurations isn’t huge (24x260W = 6,240W or 6.24kW, and 22x275W = 6,050W or 6.05kW – so a difference of about 200 watts, or less than one panel). Nevertheless, the reason for the change should be explained to you – or maybe you can ask for an additional panel, which you’d hope they would provide for free in light of the original quote. We’d suggest trying to hash things out with them until you’re happy, but if they’re being difficult and you can’t reach an agreement, you might to ask for your deposit back – or worst case scenario, take them to the ACCC.